The Border Patrol was created in 1924 and is responsible for securing and patrolling 6,000 miles of international boundaries between Mexico and Canada and 2,000 miles of coastal waters surrounding Florida and Puerto Rico. In order accomplish its mission; the Border Patrol relies on over 21,000 agents. These agents last year made over 300,000 arrests and seized hundreds of millions in illicit drugs. Since the agency’s inception, 125 Border Patrol agents have been killed in the line of duty. The Border Patrol pay system was established in the 1970’s and is different from the Customs Service and other federal law enforcement agencies like the FBI or Secret Service. 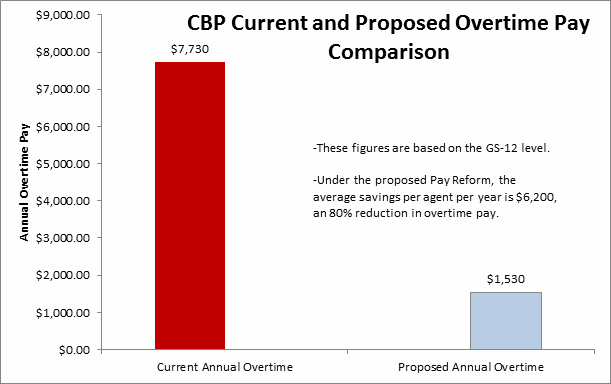 Under current law, Border Patrol agents who work in excess of 85.5 hours over a two week pay period are paid overtime of time and half up to the 100 hour threshold. Overtime that is worked beyond the 100 hour threshold is paid at half time. McAllister & Quinn and the National Border Patrol were able to legislatively change the Border Patrol Pay System to a stable system. Agents can now choose which system they are in, saving the government billions of dollars over the lifetime of the reform bill. This was one of only a few hundred bills that were passed that year, in a highly contiguous political environment. Agents will have three options: They work straight time for 100 hours per pay period and receive an annual 25% differential; work 90 hours and receive an annual 12.5% differential; or, work no overtime at all. Unscheduled overtime worked beyond 100 hours will be treated as compensatory time off (no monetary value), and scheduled overtime is paid at a time and half at the GS-10 level. Agents will face an approximately $6,200-per-Agent pay reduction under the Pay Reform. The annual cost saving to the taxpayer will exceed $125 million per year.